 UK  1985  103m   Directed by: George Pavlou.  Starring: Denholm Elliott, Steven Berkoff, Larry Lamb, Nicola Cowper, Irina Brook, Art Malik, Brian Croucher, Ingrid Pitt, Trevor Thomas, Clive Panto, Sean Chapman, Candy Davis, Karen Gould.  Music by: Freur. A group of underground mutants, disfigured by a mind-expanding drug, seek revenge against the doctor responsible for their condition. 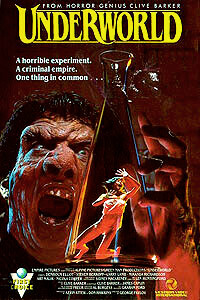 Known as Transmutations in the US this English production was directed by George Pavlou & quite frankly is crap. The script by James Caplin & Clive Barker based on one of his stories never really gets going, it never involves you, you never care about anything, it's slow, it's dull, it's utterly predictable with a pointless twist you can see coming a mile off & it's just not much fun to watch either. Being based on a story by Barker you would expect plenty of monsters & gore but Underworld features a few tardily made up creatures who get about 10 minutes worth of screen time & absolutely no gore whatsoever. I'm sure the artwork on any DVDvideo release plays up the mutants involvement in the film but seriously they don't feature properly until past the hour mark & even then their presence is underwhelming. Most of Barker's work deals with religion & mystical reasoning behind his monstrous creations but here it all revolves around a drug, yawn. Then there's the fact that London seems deserted, the character's & dialogue are poor & for some reason everyone has bizarre names like Pepperdine, Motherskille, Fluke & Nygaard. We never learn why Nicole is immune to the drugs side effects either even though it's an important plot point, it's a film where you just don't care about anything that's happening on screen. Director Pavlou also directed the Barker penned adaptation of Rawhead Rex (1986) a year later, why did Barker choose him again? Underworld is a totally flat, dull & lifeless 100 odd minutes. He seems to think as long as he bathes every shot in pink, purple, orange & blue neon that's enough to turn in a stylish flick, well he's wrong as it gets very samey very quickly & since the on screen action is so dull the awkward lighting stands out like a sore thumb. Disappointingly the film lacks imagination as well, the underworld mutants are just actors with lumps on their faces & apart from one brief scene at the end when someone pulls some skin of their cheek there isn't a single drop of blood in the entire thing. It's definitely not scary, it's certainly has no tension & has precisely zero atmosphere. Technically the film is pretty good actually, it's well made I suppose & looks very professional. How on Earth did they get such a good cast to agree to appear in this? Denholm Elliott, Steven Berkoff, Art Malik, Ingrid Pitt & Miranda Richardson all deserve better than this. Underworld is a poor Clive Barker penned film, I'd imagine most of the blame has to go to first time director Pavlou who probably ruined Barker's scripts (Barker himself admitted he directed Hellraiser (1987) himself because of his dissatisfaction with the results of both Underworld & Rawhead Rex). A disappointing waste of time, steer clear which won't be a problem as it's pretty obscure & hopefully it'll stay that way. Not to be confused with the Kate Beckinsale big budget horror action flicks Underworld (2003) & it's sequel Underworld: Evolution (2006).